Impart a sleek, modern look into your room with the 52 in. Merwry Brushed Nickel Indoor Ceiling Fan from Home Decorators Collection. The five ABS fan blades attach to the top of the motor housing, projecting a unique profile and a sophisticated appearance. A 17-Watt fully dimmable LED light is encased into the hub, with a frosted opal twist-on glass cover that integrates seamlessly for a clean aesthetic. The reversible, 3-speed motor and LED light are controlled via handheld remote control for ultimate convenience. At Casablanca we hold tight to the belief that you don't have to sacrifice efficiency for beauty. Each element is designed to be as efficient as possible - so you can feel good about your energy savings and your contribution to protecting the planet. Casablanca motors move more cubic feet of air per minute (6,129 CFM for the Concentra) while using significantly less energy. 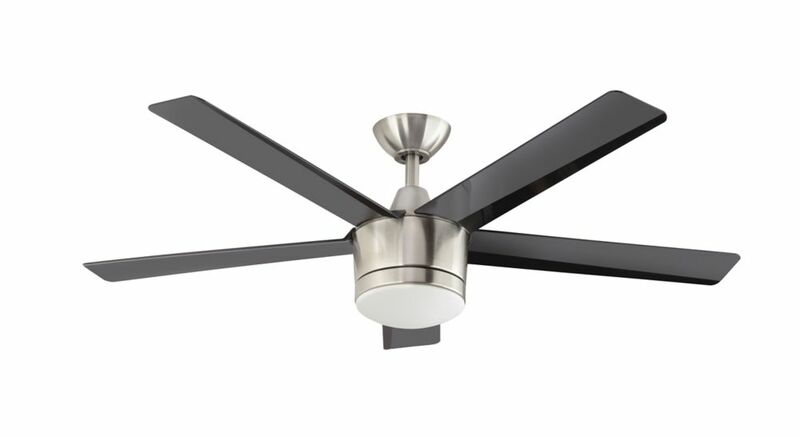 Enjoy outstanding air movement and noted Casablanca durability in a simple, high-functioning fan with a 54 in. blade span designed for large rooms. Take advantage of Concentra's uncluttered lines in Brushed Nickel and move from traditional to transitional decor with ease. Match your fan to furniture, wall colour or moulding details with reversible Walnut/Burnt Walnut blades. The Altura fans stylish design will fit perfectly in any modern environment. Contemporary style hand-carved blades with brushed nickel finish. AeroBreeze Blade Technology moves up to 25% more air than standard ceiling fans. Standard remote control included.. Limited lifetime warranty. The Carrolton 52 in. brushed nickel ceiling fan has a contemporary style which includes an updated light source. The 18-Watt LED light module will illuminate your room and is also very energy efficient. Installation will be a breeze due to Quick Fit specs such as AccuArm blade arms for easier alignment and quick install blades that use no screws. To conclude, this fan offers a lifetime motor warranty for peace of mind. Merwry 52-inch 5-Blade LED Brushed Nickel Indoor Ceiling Fan with Light Kit and Remote Control Impart a sleek, modern look into your room with the 52 in. Merwry Brushed Nickel Indoor Ceiling Fan from Home Decorators Collection. The five ABS fan blades attach to the top of the motor housing, projecting a unique profile and a sophisticated appearance. A 17-Watt fully dimmable LED light is encased into the hub, with a frosted opal twist-on glass cover that integrates seamlessly for a clean aesthetic. The reversible, 3-speed motor and LED light are controlled via handheld remote control for ultimate convenience. Merwry 52-inch 5-Blade LED Brushed Nickel Indoor Ceiling Fan with Light Kit and Remote Control is rated 4.0 out of 5 by 1. Rated 4 out of 5 by DIEGO from Great fan Just bought and installed this fan. It was easy to put together however installation instructions could have been a bit more clear. Otherwise the fan works great and provides good air flow. It is quiet and the light is bright enough for the room size. It has a wall mountable remore control that controls the fans (3 speeds) and light. I would recommend it. Can it be mounted on angled ceilings? It can but only to a certain slope. It normally will mount up to 18 degrees. If you slope is steep you may need to purchase a cathedral ceiling adapter for this ceiling fan. Home Depot does carry those and they work well with this model. Can this fan be mounted without the downrod? Sorry, this fan cannot be mounted without the rod.